‘”What does that mean?” I asked. It sounded so nice. She had a whole two-and-a-half days to pack in all that chilling before taking off on a family vacation, then heading to sleep away camp. But I imagine she won’t have too much trouble picking up right where she left off when she returns. Her sister is a different story. Chilling is a concept that Abby has always had trouble grasping. She likes to have plans. She likes to be busy. As I wrote in my last book, as a toddler she famously said, I’m so glad I’m not awake when I’m sleeping, because I’d be so bored. But mostly, there was baking. There is a long tradition of summer baking in my house. (Remember our Summer of Self-Sufficiency?) I’ve always believed that baking is the gateway drug to cooking, and I encourage them to get creative with the standing mixer whenever possible. Plus, even though I myself am much more of a cook than a baker, we have a pretty decent library in our kitchen, so cookie and cupcake inspiration is always only an arm’s length away. Which is why I was surprised to hear her answer when I asked what book she’d like to browse for ideas. But as soon as she showed me the recipe she was planning on making, a molten Red Velvet Oreo Lava Cake, I understood. It involved whipping Oreo filling with cream cheese, and molten cream oozing out of the final bright pink product and all I could do was picture a bunch of really savvy people sitting around a conference table saying How many things can we put in this recipe that a 13-year-old kid would go literally crazy over. …sliced, and then, supposedly, dipped into white chocolate. I made her skip the white chocolate part on principle. 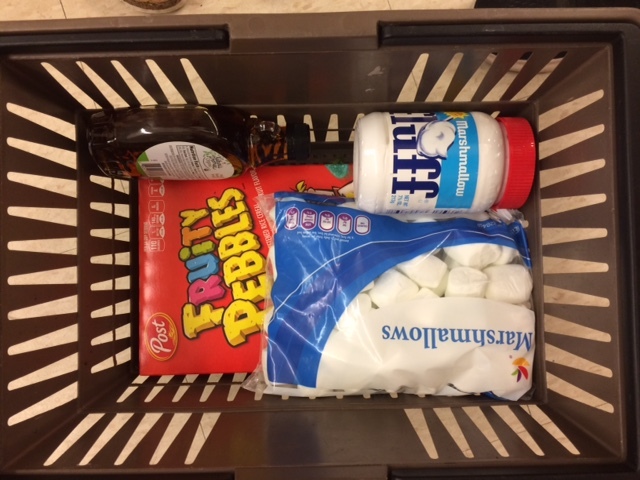 “Is it not enough to schmear a sheet of buttery, sticky Fruity-Pebbles with Marshmallow Fluff?” I asked when we were shopping for ingredients. “You really think this recipe needs white chocolate? You really think this basket is missing something sweet?” We looked at the basket. Of course, none of these recipes are based on what they need from a flavor profile perspective. It’s the obscene over-the-top-ness of them — sugar on top of sugar on top of sugar — that is so appealing. I put my sunglasses and baseball hat on before heading to the register. The good news, though, is that I was rarely doing the shopping with her. I was rarely doing any of it with her actually, which is of course a good way for anyone to learn the ropes. (Though I will say that So Yummy has a tendency to condense a complicated technique into mere seconds, so it’s easy for kids to end up frustrated.) A big part of the project was walking into town to procure ingredients on her own with money from her own wallet. So by the time she selected the recipe, shopped for what she needed, baked whatever madness was on the menu, then cleaned up the whole thing, a good chunk of the day was gone. And a good chunk of something sweet — really sweet — was waiting for us after dinner. 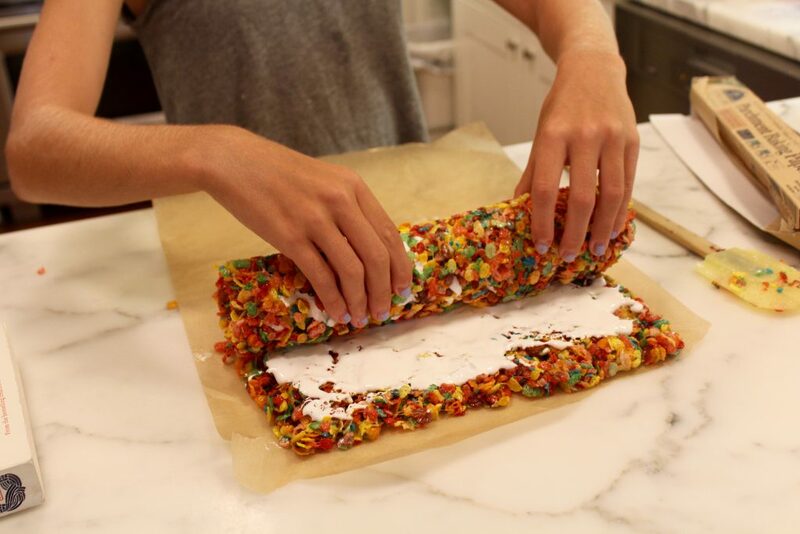 My 12 year old definitely saw the same so yummy Instagram video about the fruity pebbles rice krispy treats. 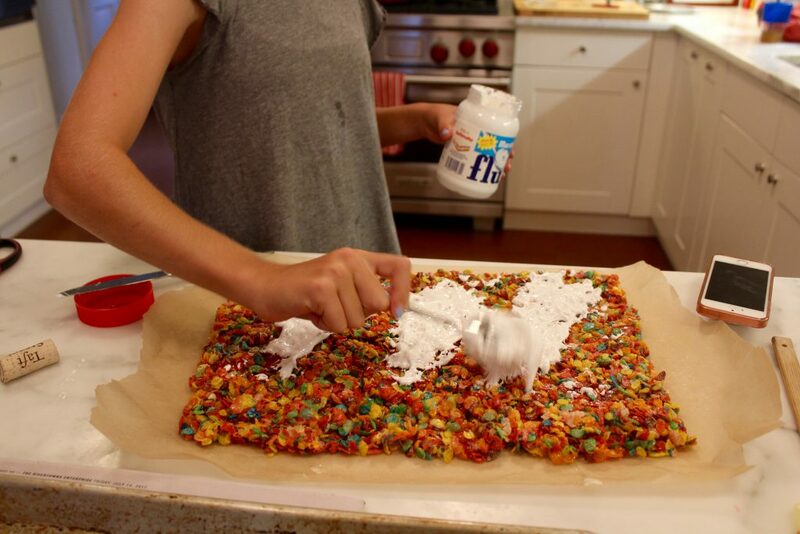 He didn’t show my the video though so I just told him to make regular rice krispy treats with fruity pebbles (no extra fluff and drizzle). They actually weren’t as horrible as I thought they’d be. I used to give the kids a couple days and then say, Let’s write down your summer goals! Summer workbook was always one and then something like learn to do your own laundry but I also made sure there were some fun ones too. Baking is a gateway drug! That is so awesome! I wish i had been given more incentive to get into the kitchen. I cook for myself fine, but I’m 29 and I still don’t clean the kitchen good enough for my mom. 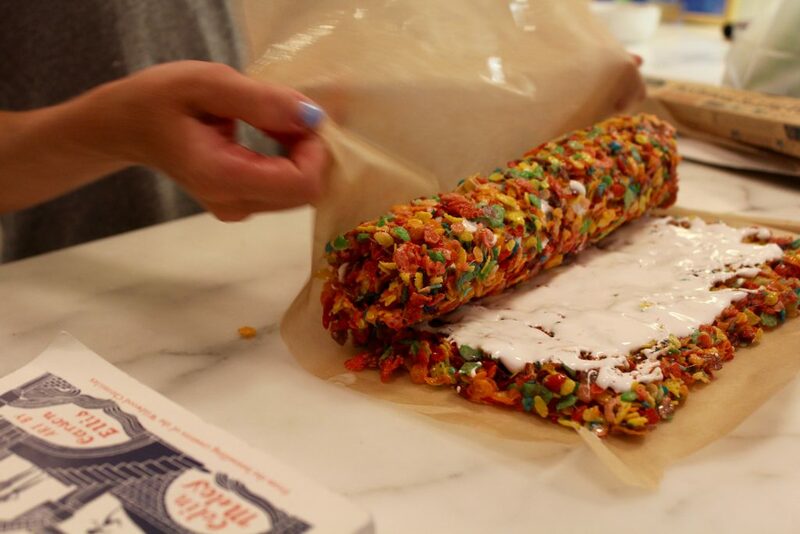 thought was, “That would look better with the white chocolate dipped in rainbow sprinkles at the end.” There is no sugar ceiling on a truly ridiculous dessert. Anyway, I’m making them for my 3-year-old’s school birthday party in a couple of months. that is so funny about the sugar ceiling, and so so true. I wish that was my summer now, how fun! Well….. my almost 10 year old daughter who loooovvvvesss to bake is now obsessed with this insta account… she says “thank you!” My waistline does not . 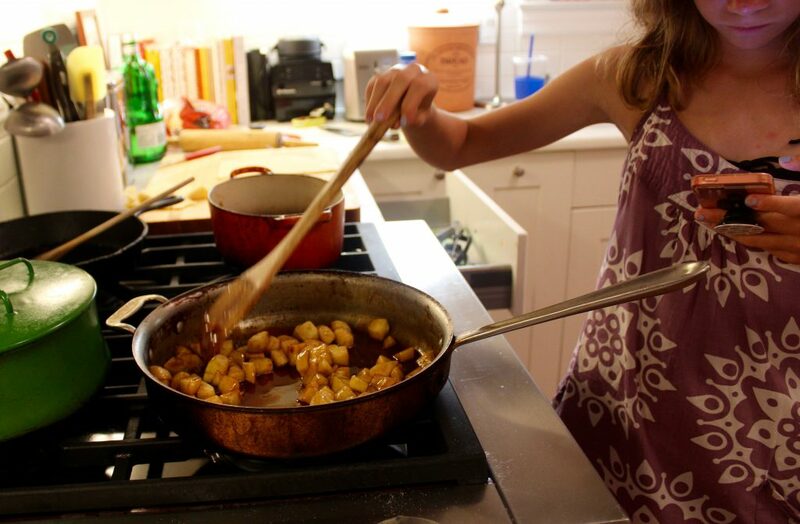 Thanks – I may see if my 11 yr old, too cool for cooking, kiddo wants to try any of these. The whole shopping for ingredients and then making and cleaning up sounds like an excellent time consumer. Maybe he could make treats for his pals to eat at the beach…. 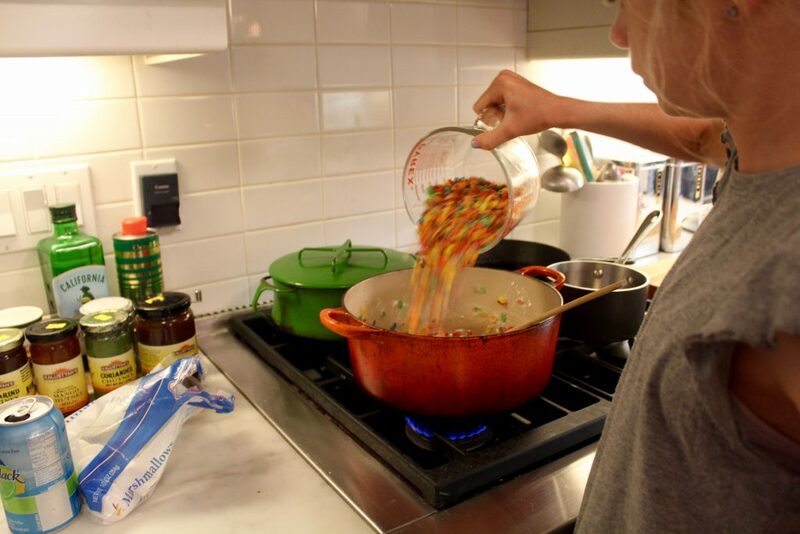 (so I won’t have to – my teeth hurt just reading about those fruity pebble roll ups). Has Abby done candy sushi? slit large marshmallows in the middle to insert a swedish fish inside each, then wrapped each with fruit roll up around the outside. My kid loves this. She has not done that kind of candy sushi, which sounds a whole lot easier than what we did at her party five years ago. Love that idea. Here’s the sushi party…. I hope that the items in your red basket were appreciated by a cashier who knows you; perhaps their family was regaled with the tale of your clandestine purchase while they ate some Salad Pizza. I’m planning to aggressively chill for my 30th coming up…and to bake a sour cherry and dark chocolate cake 😉 I agree, getting me in the kitchen with weird kids recipes as a preteen was an excellent way to boost my confidence (maybe inflate it…) so I was eager to try more things in the kitchen as I got into my late teens and began the process of moving out on my own. Now I make my own bread, yogurt, granola, you name it! 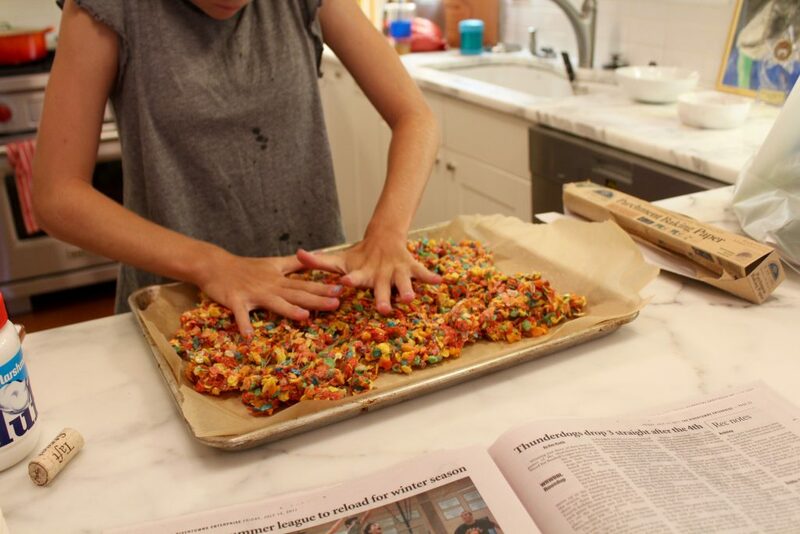 Look at your girl sauteeing and rolling sweets with parchment paper! Great skills already, she’s on her way to being a pro in the kitchen-very impressed! I have my holiday booked for next week, and I plan to chill as aggressively as possible, although like your daughter I have a tendency to enjoy planning plans and following through with them. I really should look into baking some more… I do enjoy it but find it so time-consuming.